Communities living in Chimanimani district, in the mountainous province of Manicaland, Zimbabwe, are slowly coming to terms with the havoc wreaked by cyclone Idai, which resulted in the death of more than 169 people in the area (according to the Civil Protection Unit). Few will forget the night of 15 March 2019, when winds of 200km an hour tore through the valley, bringing such heavy rains that rivers and their tributaries burst their banks, and landslides washed whole houses away. Community members have different tales to tell. Heavy rock fall caused some to experience what felt like an earthquake. Others heard sounds like heavy trucks moving. Their stories speak of a community that is still in deep shock. In these small communities, almost everyone knows each other and everyone has been affected. Children, brothers, sisters, mothers, fathers, neighbors, or whole families have been lost. Many have relatives and colleagues who have still not been found. More than 328 people are reportedly missing and 11 255 people have been displaced in Chimanimani. 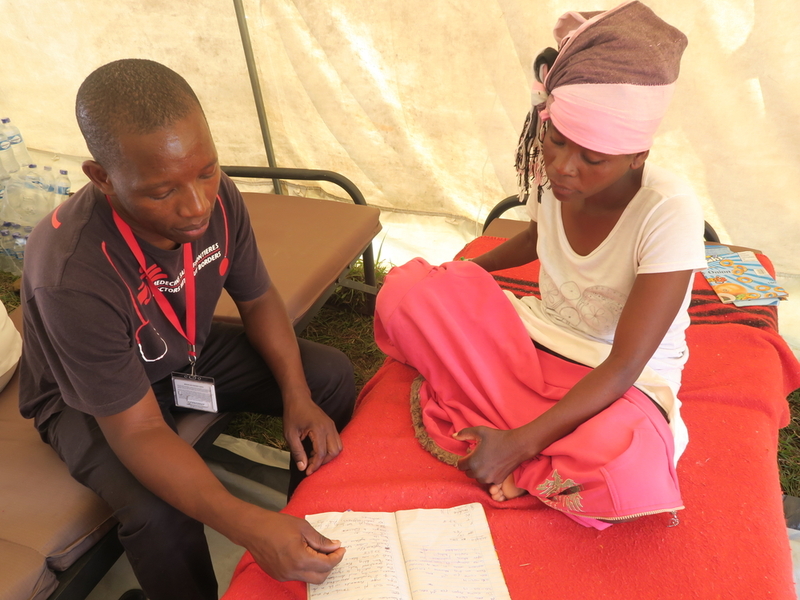 MSF nurse mentor attends to a patient, Nyasha Mhere of Chinamira village at a stabilisation centre run by MSF in collaboration with the Ministry of Health and other partners in Chimanimani, eastern Zimbabwe. Some village members have spent days digging, trying to recover the remains of loved ones buried under boulders. A detection of smell or flies lingering, being a signal of a possible dead body underneath. Some bodies were retrieved using this cruel tactic. This catastrophe, the first of its kind to be experienced in the area, left a trail of destruction in the community and changed the lives of many in an instant. In some communities, houses, shops and factories were completely destroyed, and all that remains are rocks, and wood. Many lost everything including food, shelter, clothing and their sources of livelihood. Life saving medication, for chronic diseases such as hypertension and diabetes, washed away. As news filtered through of the destruction in Chimanimani, an MSF team quickly travelled to the area. Yet with roads and bridges destroyed, Chimanimani was completely cut off from access, making it difficult for humanitarian actors to quickly provide aid. With the health ministry, MSF set up a stabilisation center at ‘Skyline’ on the outskirts of Chimanimani. The injured were ferried by Army and private helicopters from inside Chimanimani to ‘Skyline’, with the most seriously injured being transferred to the nearest referral hospital in Chipinge. A total of 80 patients were airlifted to medical centres while a total of 232 patients had received medical assistance from a combined effort of various medical practitioners as of 26 March 2019. With water pipes destroyed by the cyclone, the lack of clean water sources in Chimanimani is a concern for water borne diseases like cholera and typhoid. There are still bodies lying buried under rubble in river beds, which also contaminates drinking water. 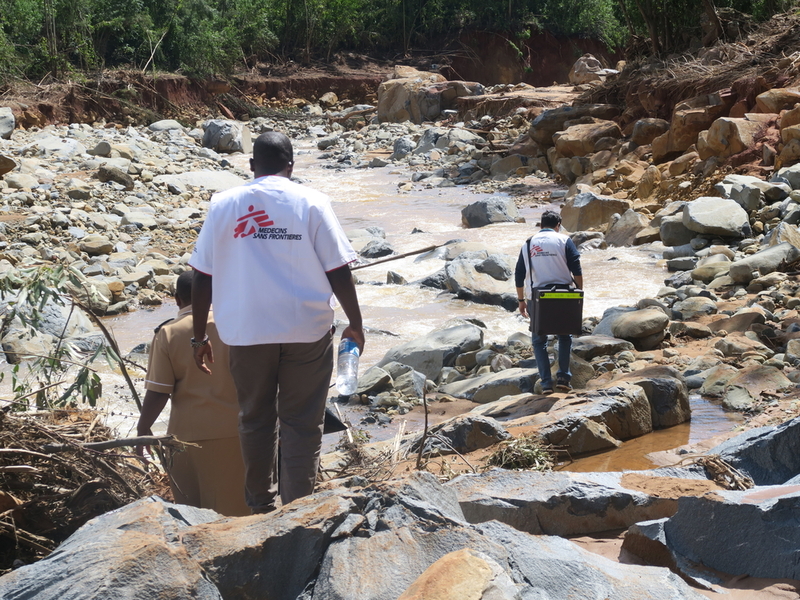 MSF teams are supporting the Ministry of Health and Child Care to provide medical assistance including provision of chronic care medicines to people that were affected by Cyclone Idai.